Season pork with salt and pepper. In 6-quart Dutch oven, heat oil over medium-high heat. Cook pork in oil 10 to 12 minutes, turning frequently, until well browned on all sides. Transfer to platter; pour off all but 1 tablespoon fat from Dutch oven. Add onion; cook about 6 minutes, stirring occasionally, until onion is softened. Add garlic; cook and stir 1 minute. Reduce heat to medium; add tomato paste and cook 2 to 3 minutes, stirring occasionally, until it darkens slightly and turns rusty in color. Add wine and cook 1 to 2 minutes, scraping up any browned bits, until thickened. Stir in crushed tomatoes, thyme, rosemary, broth and pepper flakes. Add pork with any juices accumulated on the platter. Heat to boiling; reduce heat to low. Cover and simmer 2 1/2 to 3 hours or until pork is tender. Using 2 forks, shred pork into bite-size pieces in Dutch oven. Serve sauce tossed with pasta or over polenta, if desired. 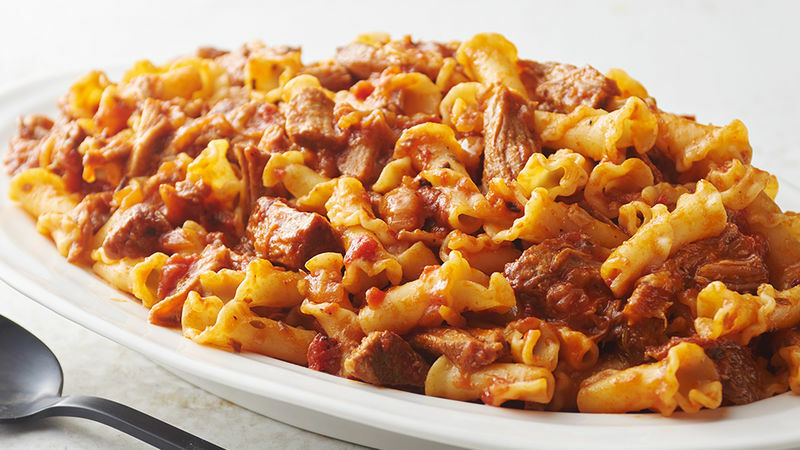 Ragu is a thick pasta sauce that pairs well with a variety of short, dried pasta shapes. Penne is a great choice, but consider other options like campanelle, gemelli or cavatelli. Ladle the cooled, cooked sauce into freezer containers, and keep in your freezer up to a month. Just thaw in the refrigerator or microwave before thoroughly reheating and tossing with pasta. Recipe makes enough for 2 pounds of pasta, using 3 cups of sauce per pound. Heat the sauce in a 4-quart saucepan over medium heat. Add the cooked pasta, and toss to coat.